Jeffrey Swaluk is a versatile artist who has explored many painting styles, from Photorealism to Impressionism. Taking workshops with internationally known artist Charles Sovek inspired Jeffrey to explore a looser, more expressive painting style. While he once strove to include as much detail in his paintings as possible, he now improvises upon the scene in front of him, much like a jazz musician playing with a classic tune to give it his own unique spin. He exaggerates colors for expressive effect and leaves out details that could distract the viewer from the essence of the scene. In doing so, he says more with less. Having recently moved to Amherst, NY, Jeffrey enjoys painting the historic architecture of nearby Buffalo as well as the wilderness areas of NY State. 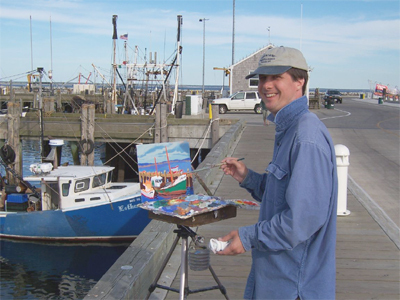 In addition, frequent trips to visit his parents in Brewster provide him with opportunities to paint Cape Cod subjects such as beaches, fishing boats and harbor scenes, as well as Cape Cod's own distinctive architecture. Jeffrey exhibits his work at the Elmwood Avenue Festival of the Arts in Buffalo and at the Clothesline Festival in Rochester. He is a member of the Genesee Valley Plein Air Painters, the Niagara Frontier Plein Air Painters, and the Buffalo Society of Artists. A committed teacher, Jeffrey leads workshops for artists. He also teaches private painting lessons, customizing the lessons for each student's particular needs. May 23-27, 2011, Jeffrey will lead Finding Your Style, a five-day workshop at the Peninsula Art School of Door County in Fish Creek, WI. His web site, www.swaluk.com, has recently been redesigned to provide more tips and tutorials for artists. Jeffrey is also a classical musician. He received his Bachelor of Music from Oberlin Conservatory of Music and has performed with the Richmond Symphony Orchestra. He also performed in Colonial Williamsburg as a member of the Governor's Musick, a chamber music ensemble specializing in 18th century music performed on original instruments of the period. With the Governor's Musick he recorded a CD, A Delightful Recreation, the Music of Thomas Jefferson. This recording was featured on a national radio broadcast presented by Colonial Williamsburg and American Public Radio in 1993. Also a violinist, during 2001-2002 Jeffrey was appointed concertmaster of the Lake Union Civic Orchestra in Seattle, WA, the concert proceeds of which are donated to the Fred Hutchinson Cancer Research Center.